We had a little snow yesterday – none (so far) today, and what is out there is melting. I took this shot alongside the house. 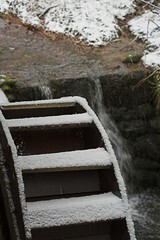 The water wheel is not actually in the water at the moment, but I thought this made a nice composition. I’m officially jealous … no snow here yet. STILL no snow here either, though, which thoroughly frosts my tonsils.